Day 2 started with a shuttle—the only free ride of the day. I think our raw hunger to ride made it hard to appreciate motoring to the top of the mountain, but pedaling up the first liason made sure we looked back with sincere thankfulness. The climb itself wasn’t so bad, it was the exhaustion from surviving the rides down the stages that reminded you this was a true enduro race. One new adjective we learned on this trip, at least as far as mountain biking goes, is “savage.” The locals seem to use the word to describe bits of trail that are universally agreed upon to be at the upper echelons of challenging, no matter the riders’ skill level. Stage 1 absolutely qualified as savage. The basic outline is incredibly steep, long, technical chutes dumping into flat, moon-dust turns without enough moderate grade between big features to let your arms rest. Repeat that 10 or 20 times and gradually increase how steep the chutes are and you’ll have a good idea of this trail. Bear made it down clean and I had one slide-out, but Cam dropped his chain and went down twice—not the best way to start the day for him. Either way, when we got to the bottom, we were all buzzing from the insanity we’d just survived. It was going to be a good day. After a healthy stop at the aid station and a long climb back up to the top, we dropped into Stage 2. Slightly more forgiving, this section of trail was still steep and technical, but earned the words “more flowy” in its description because there were berms to hit at the bottom of big features, meaning you could let go of the brakes a bit without fear of certain death. The bottom-half of this stage had some nice, hand-built sections of trail, which included ladder bridges, table-tops and really nice turns. Bear and I made it down this one clean, but Cam had bad luck again, flying off one of the ladder bridges—about 7 feet to flat—and taking a good tumble. If ever I’ve felt like I forgot to ride a bike, it was during this stage. A non-scientific survey I performed at the finish line suggested unanimous agreement among the other riders. One of the shorter ones, this brutal mess of twisted singletrack fell straight down the side of a mountain in an unending series of steep, off-camber, moon-dusted-laiden switchbacks. Try as we might to stay upright, most riders got swallowed up somwehere along the line, wearing their failures proudly in the color dust as they rolled thankfully to the second timing chip. Almost every time, the immediate reaction after swiping their chips was a series of explitives, accompanied by huge grins and heaving breaths. Other than a few really big, really steep features littered throughout, Stage 4 leaned slightly more on the “epic, yet fun” side of the scale, versus the emphasis on basic survival that seemed to be the theme of the first three outings of the day. Dropping through a few of what had become familiar, harrowing chutes rewarded you with fast, flowy single track that screamed through beautiful forest. This might have been the most pedall-y stage with a few fire-road sprints, but even those were somewhat of a reprieve from an otherwise supremely technical day. Sadly, I flatted halfway through this stage. Because I had so far to go, I decided to ride it out, which meant that my sprints were twice as hard. I would have loved to have burned through the most fun section of the trail at the end, but alas, you have to take racing with the good and the bad. Bear had a clean stage, but Cam had another mechanical and another big fall. It wasn’t turning out to be his day, but he kept his chin up and his pedals spinning. Stage 5 is fuzziest in my memory, especially since I failed to start the GoPro at the beginning and can’t go back to review footage. I do remember that it was shorter stage that started out with a steep, nasty drop right at the beginning, then wound through the woods, alternating between fun features that were easy to ride fast and others that seemed to come out of nowhere and remind you to keep your eyes up and mind focused. One of my favorite parts was running a root-laiden ridgeline that rode and looked like the epitomy of British Columbia. In fact, even though the overall details are fuzzy, I specifically remember ripping down that ridgeline, looking around and being fully aware that I was in BC, soaking up every inch of incredible singletrack. The final leg of the day was the least technical—a reward of sorts for surviving the first 5 challenges. This stage started out with huge, banking burms that you could absolutely rail if you took the right line and kept your eyes up. A few technical bits were followed by more fast-and-flowy singletrack that was just plain fun. Bear had the cleanest day, logging only one single crash on some of the most consistently technical terrain the Brothers had ever tackled. I had a few minor tumbles and a mechanical, but was really pleased with a decently solid day of riding. Cam had a rough one. He had big crashes on every stage and threw his chain several times. Needless to say, it was hard for him to balance the frustration inherent in a bad day of racing with his first full serving of raw British Columbia riding. Even though our race runs ran the spectrum from good to bad, one thing was clear: Revelstoke had given us our first taste of a true, long and brutal enduro race on a proper track—and we loved every single second of it. What’s more, we had the first indication that we’d proved the hypothesis we’d set out to test: could some Pisgah-raised, day-job amateurs from the Southeast hang with riders from around the world on the fabled testing grounds of British Columbia? At 22nd (Cam), 21st (Eric) and 17th (Bear), it seemed that the answer was yes. With one more day ahead, we were confident that we could hold on to the bars long enough to inch our way deeper into the top 20. Really, though, with a heli drop looming on the morning horizon, results didn’t matter. Soaking in every bit of British Columbia we could was at the top of the priority list. And with that, the sound of imaginary chopper blades lulled us to sleep. 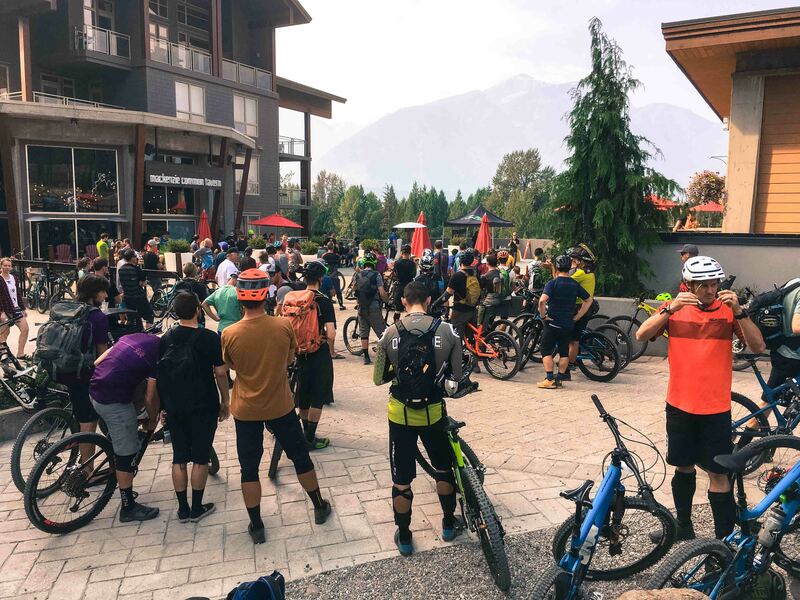 When you’re in the company of more pro riders than you’ve ever raced with and the organizer issues that warning multiple times before you start the race, you know that British Columbia means “black diamond” when they say it. As humbling as the trail was, we couldn’t get enough of the steep, sketchy and tight singletrack. For the second time in a row, Revelstoke had pulled our faces into smiles that lasted long after the wheels stopped spining. We shared those smiles with world-class people from near and far—we met people from Germany and New Zealand. As I’ve written before, there’s something special about an event with no egos, where the pros, privateers and posers (like me) are one community. That says a lot about the organizer, so good on you, Ted. The rest of the afternoon rolled along at an easy-going pace. We visited a few bike shops, soaked our legs in the Columbia River and grabbed a few groceries. As I’m writing this, the brothers are whiping up some salads and talking about what movie we’re going to watch tonight to force us to rest for the big day tomorrow. Days like this one are darn-near perfect, but I can already tell this is a place where they are plentiful. Jump straight to the video here. Waking up in a tent to the rushing sound of the Columbia River—especially after 18 hours of travel—might be the best way I’ve ever received official notice that my adventure had begun. After scrounging up some grub in Calgary, we settled into a 5-hour drive towards Revelstoke in search of a place to bivy for the night. Some time after midnight our headlights guided our weary eyes towards a dirt road just outside of town, close to the banks of the river. Our desire for sleep made quick work of the tent and before we knew it we were lulled to sleep by British Columbia’s gentle soundtrack of rustling pines and rushing water. Having an entire day to kill before a race is a luxury, of which we took full advantage, beginning with a leisurely breakfast at La Baguette, which seemed like somewhat of a local launching point for the adventure-inclined. That meant being completely new to town wasn’t a problem: we fit right in. Sufficiently filled with caffeine and sustenance, we headed down to a river-front park to build the bikes, organize the hastily-improvised packing job in the back of the truck and take some time to stretch travel-tight muscles. 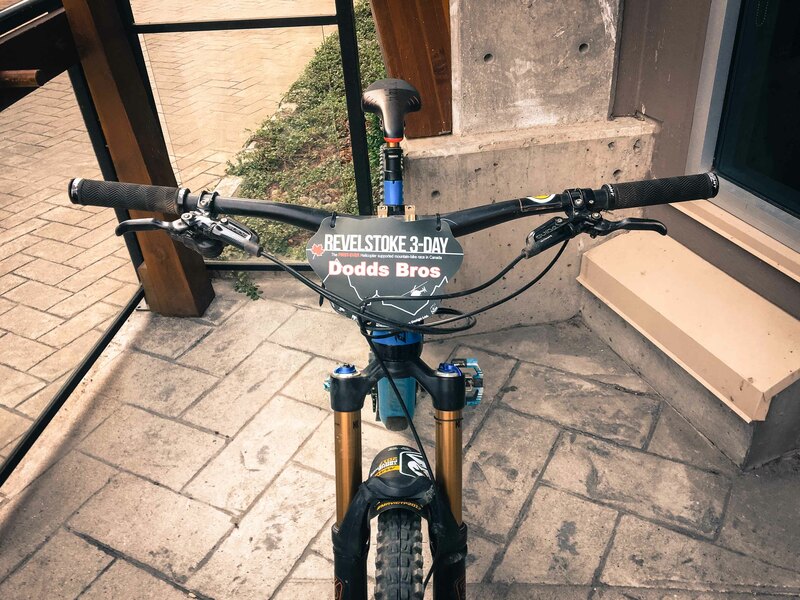 Once the ponies were bridled and our riding kits were archeologically extracted from a mountain of gear, we were ready to taste a sample of the fabled Revelstoke single-track. Ted Morton, the race organizer, pointed us towards Keystone Basin, which several people at the local bike shop confirmed was one of the best alpine rides around. They were right: it’s absolutely stunning. The punchy climb at the beginning is more of a warning shot to those easily deterred by pain. 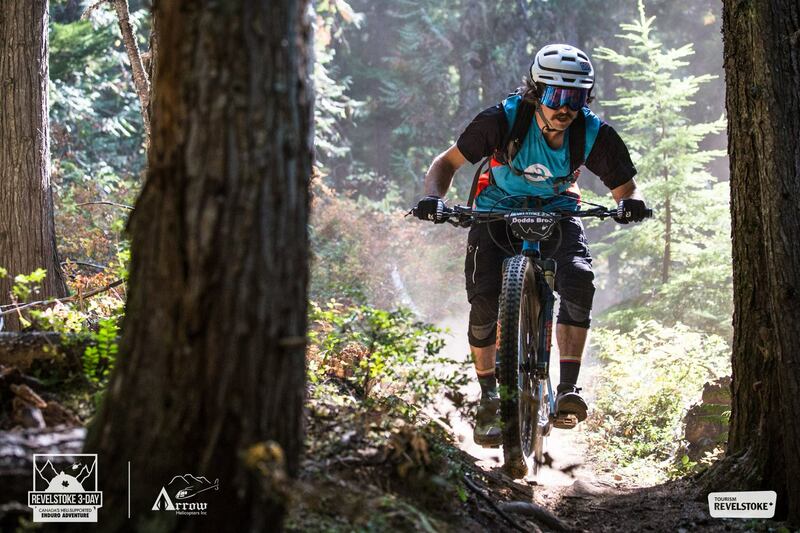 It’s not bad once you get to the top, but steep, technical, chest-on-stem climbing out of the gate is enough to make even seasoned riders feel clumsy and out of shape. Clearing the pines at the top of a hill, though, dumps you suddenly into a wildflower-blanketed alpine meadow with 360º views of gigantic peaks in every direction. Tracing the tiny ribbon of single-track as far as you can see into the hills ahead helps melt away any doubt that pushing forward was the right choice. From that meadow onwards, aggressive riders can gorge themselves on a healthy mix of up-and-down, flowy, steep and technical sections. There’s so much to love, but we all agreed that the defining experience of the day was chasing each others’ dust trails through the serene meadows, railing natural berms as hard as you possibly could and wondering the whole time if what you were experiencing was real. 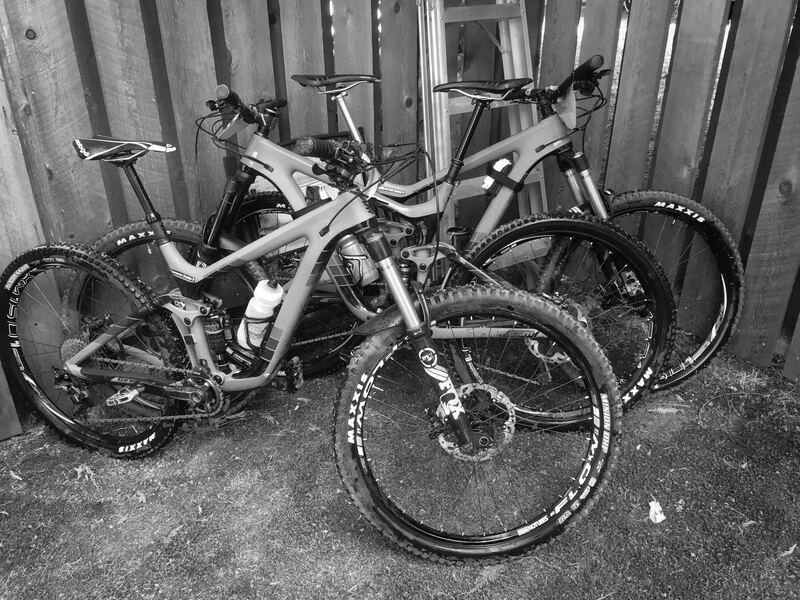 The high from riding alpine trails lasted the entire evening as we devoured huge helpings of loaded mac ’n cheese, sprayed the bikes down and fell headlong into comfortable beds. Big adventure trips are funny things: it’s easy to define the experience by what you do on the adventure, but more often it’s what you were doing before the adventure that sets the tone for the experience you’re about have. I’m writing this post from an airplane that’s speeding towards British Columbia, where both of my brothers are waiting at the airport with a truck full of bikes and gear. The next few weeks are going to be absolutely incredible, but not simply because the Canadian Rockies are a destination; for us, on this trip, they will be a refuge. As is often the case with life, each of us has gone through twists and turns between entering the lottery and actually packing our bags. My life changed significantly two months ago when a business I helped build over the last 5 years suddenly announced it was closing. I think it’s fair to say that Cam’s road weary and a little lonely after spending a few months in Europe (and most of his savings) climbing some of the best rock the western world has to offer across the Atlantic. Bear had an epic trip to France this summer, but has paid for it ever since with one of the worst night-shift schedules I’ve ever seen, making normal sleep an elusive dream. Those challenges are nothing to complain about. In general, life is good. We all feel blessed beyond imagination. I’m not a psychologist, but if I had to diagnose how all three of us were feeling before the compass pointed West, I’d call it a case of weariness from the normal wear-and-tear of life. In other words, sometimes life just feels like a bit of a grind, no matter what your circumstances are. For us, the earthly antidote to life’s toils is simple: mountains. No matter how crazy things get, the mountains are always there. As a destination. An escape. A refuge. The mountains don’t care about your problems and they demand that you to disconnect and remember, for a moment, you are small. I think it’s safe to say that all three brothers need this trip. Cam decided to drive from South Carolina to Revelstoke, picking Bear and I up at the Calgary airport along the way. Our team photographer Zach Suggs joined him for the drive. One of the highlights of their trip was a rip through the Wilson trails outside of Jackson Hole, Wyoming. I’ve never been to the interior of British Columbia, but in a weird way I already feel myself falling in love with it. Revelstoke might not be the first town that comes to mind when people think about Canada, but when you mention the word to someone who’s been there, the pause for a moment and what looks like a well-earned smile starts to form on their face. So, in just under an hour, I’ll land in Calgary. I’ll hug my brothers. We will drive to a small town that has a really big reputation. We will drink local beer, share stories and make last-minute adjustments to our bikes. And then we will take refuge in the mountains, on some of the best trails that the world has to offer. We will soak in Revelstoke for all it’s worth, and we hope you enjoy riding along with us. It was an epic, 6-day journey in which the shortest start-to-finish day was around 7 hours. Bear was tested in every way—endurance, technical skill and, most of all, the drive to keep pedaling (or hiking) when it already felt like he’d given everything. Bear, we are so proud of you! Well done, young brother. Every trail is like the hardest trail I’ve ever biked. I’m keep thinking, “there’s no way on earth it could be more difficult,” and it’s like WTF! Today was a little more mellow. Slammed hard once but it was all good. Bike hasn’t make a peep. For real these trails are like downhill courses. 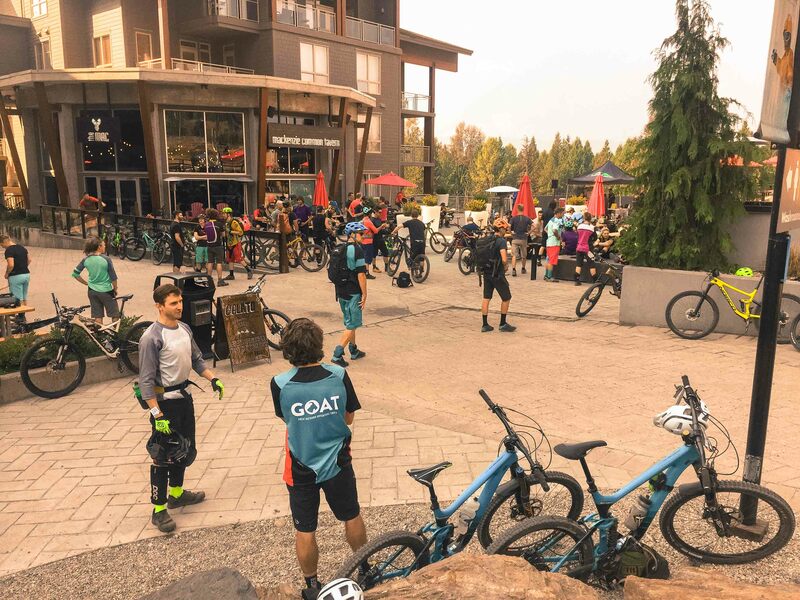 The photo gallery is below (not too many pics from the trail), but first, here’s a video of the crew riding through a heard of goats!